16.8 Million U.S. Artists, Crafters, Hobbyists Can Find Plenty of Inspiration in ez Mini CNC Router Made in the U.S.A.
CNC Machine Manufacturer ez Router, Inc. cites various uses for its compact, high quality 30” x 30” freestanding ez Mini CNC Router made in the U.S.A.
People who use the ez Mini CNC Router take their craft seriously. They’re dedicated to woodworking, enjoy tinkering with different ideas and consider it a part of their lifestyle. U.S. sales in the woodworking/wood crafts industry total billions of dollars per year. Estimates published by the Craft & Hobby Association reveal that it is not uncommon for more than $3 Billion to be spent annually in support of hobbies which involve woodworking and wood crafts. Additionally, the CHA reports, about 15 percent of all U.S. households participate in related activities. Texas-based CNC machine manufacturer ez Router is poised to serve that 16.8 Million – and growing – population of U.S. artists, crafters and hobbyists with its ez Mini CNC Router. “This freestanding unit is perfect for artists, crafters and hobbyists looking for an entry-level wood router,” says ez Router Owner and Co-Founder Daniel Berry. CHA statistics show that, in 2010, the woodworking/wood crafts segment ranked top in annual sales among all other popular craft sectors tracked in their U.S. Attitude & Usage Study. That same year, it also ranked among the top five craft segments as measured by household participation. Additional information about freestanding and tabletop options for the ez Mini CNC Router can be found at ez-Router.com or by calling (855) EZ-ROUTER (397-6883). 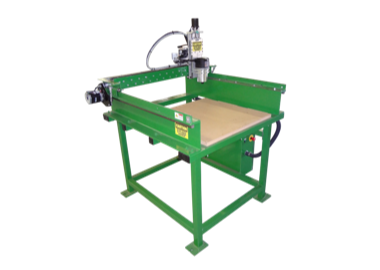 The website also features ez Router’s full line of CNC routers, plasma cutters and more. ABOUT EZ ROUTER: Based in Mineola, Texas, ez Router sums up its history nicely: “We didn't invent CNC; we just made it EZ”. The company’s goal is to offer highly robust, affordable CNC machines for all applications. Using steel and aluminum made in America, each of ez Router’s machines is proudly made in the U.S.A. The company boasts a high production rate and growing list of standard and custom CNC routers and plasma cutting machines which make life EZ for businesses and hobbyists.